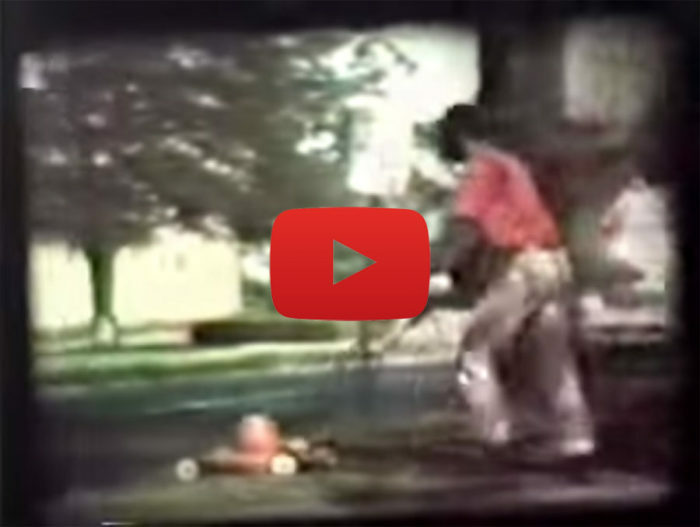 A YouTube video (click to play) combines performance footage of the band Jon Waine (taken by Sue Swakenhammer) with footage of their lead singer, artist William Pope.L, pushing a lawnmower (taken by the band’s guitarist, Brian McCormack). 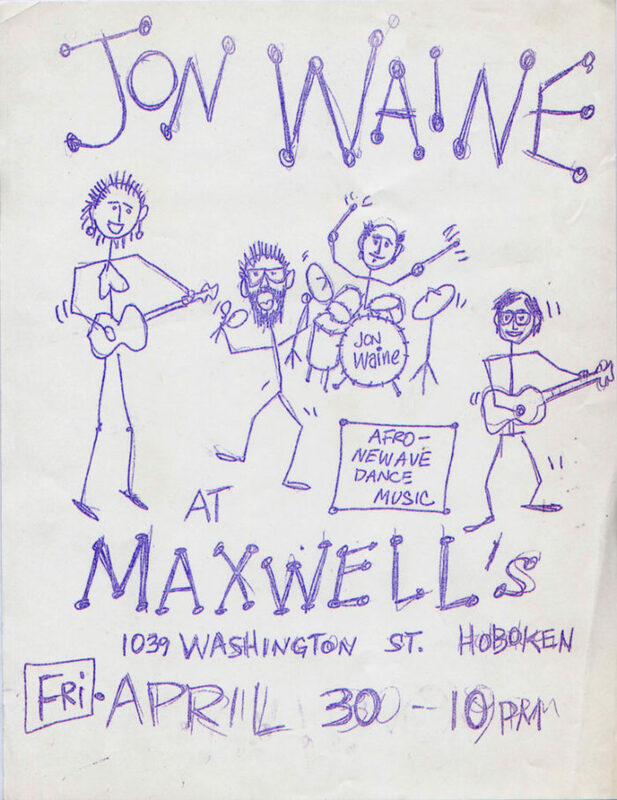 Flyer for Jon Waine concert at Maxwell’s in Hoboken, NJ, advertising “Afro-Newave Dance Music,” 1982. Art by Franc Palaia. This week, the art world’s spotlight is on William Pope.L, the latest winner of the Bucksbaum Award, given to one participant in each Whitney Biennial. Pope.L’s contribution, “Claim (Whitney version),” consists of a small room covered inside and out with several thousand slices of rotting baloney, each decorated with a black and white portrait. Though a typo-ridden text hanging inside the room provocatively alleges the subjects’ Jewishness, their actual identity is deliberately left ambiguous. (Pope.L has previously done similar pieces around Black identity.) In spite of its repellent scent, Pope.L’s piece has won him $100,000 and an invitation for a one-person show at the Whitney. Our congratulations. Over his four-decade career, Pope.L has mixed object-making with performances—most notably “crawling” pieces like “The Great White Way, 22 Miles, 9 Years, 1 Street” (2001–2009). Left out of most biographies is the fact that he cut his teeth as the lead singer in a rock band, Jon Waine, formed while he was still an art student. With songs by Pope.L and guitarist Brian McCormack, the band stayed together from 1980 to 1983, playing the hottest venues in New York and New Jersey. Vintage Jon Waine performance footage was recently digitized and put on YouTube by McCormack, overdubbed with audio of their no-wave dance-craze parody “Do the Tic.” Pope.L’s charisma as a performer is on full display, and there are even hints of the comic take on race politics that characterizes much of his later work. The YouTube video concludes with footage of Pope.L pushing a lawnmower on a bustling suburban sidewalk—a public performance that shares a provocative ambiguity with his crawl pieces. Gallery 98 recently received a collection of rare Jon Waine ephemera from the group’s drummer, Franc Palaia. In addition to the Whitney Biennial, Pope.L’s early work is on view in New York at Mitchell-Innes & Nash, 1018 Madison Avenue, through June 30. 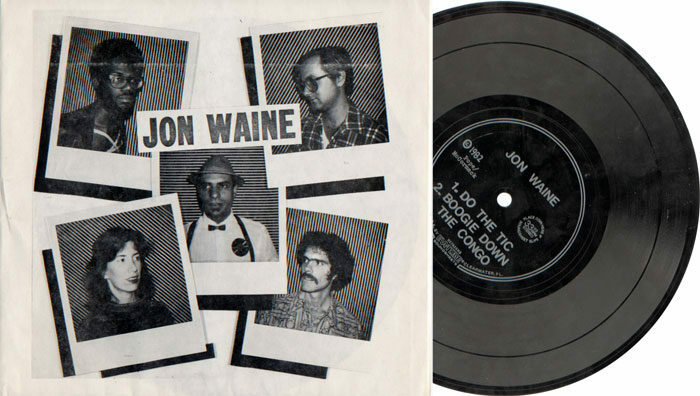 Gallery 98 has recently obtained several copies of the rare self-released Flexidisc single “Do the Tic”/“Boogie Down the Congo” (1982), the only known release by the band Jon Waine. The sleeve features photo portraits of each band member: (clockwise from top left) singer William Pope.L, guitarist Brian McCormack, guitarist Steve Davidson, bassist Ellen LaForge, and (center) drummer Franc Palaia, who also designed the package. 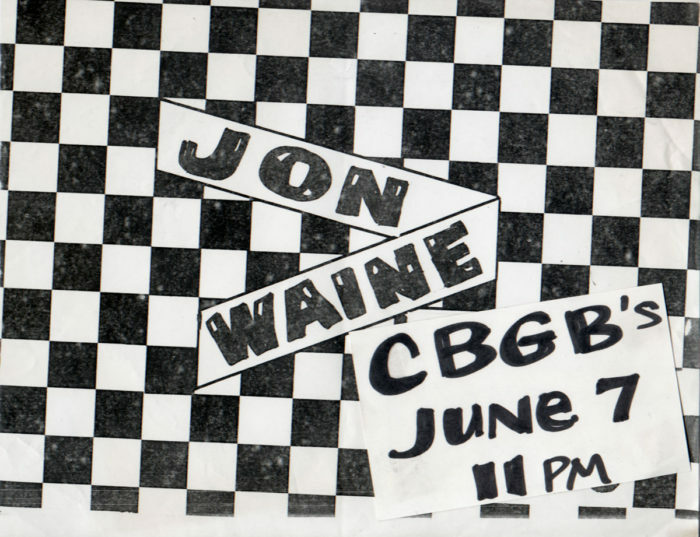 Flyer for Jon Waine concert at CBGB. Art by Franc Palaia.